Fit & Fresh approached me recently to review a few of their popular lunch products. We already have a few Fit & Fresh products that we love so I was curious and excited to try a few more products from their lunch line. A bento lunch box with it's own case in these fun sun swirl colors! I love the quality of the lunch bag (great for both boys and girls) and my kids loved the look of the laptop like bag! The bento lunch kit comes with the lunch bag, a lunch box, two small containers with lids and built-in removeable ice packs in the lid. The liunchbox is microwave, freezer and top rack dishwasher safe! 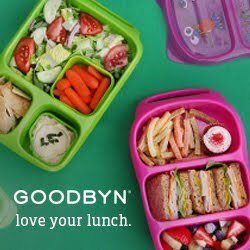 The bento lunch kit is very versatile, easy to use (even for small hands), colorful, and easy to clean. The large conatiner holds up to 3 cups of food and the small containers hold up to 0.75 cup of fruit, snacks, applesauce or yogurt and the new lid makes them leak resistant! We have packed everything from applesauce to yogurt and fruit dip and love that the new lids keep the food in the containers! Goldfish crackers, grapes, a whole peanut butter and jelly sandwich with a pumpkin second layer and a gluten free cereal bar. Goldfish crackers, grapes, a small pumpkin shaped peanut butter and jelly sandwich. My kids love dips of any kind and the Kids' Dip N' Dunk Snack Container is perfect. We packed peanut butter and celery but the possibilities are endless. I loved the ice pack in the lid that ensures the dip stays cold until lunch time. So, no matter if your kids prefer Ranch dressing, yogurt and honey or nut butter you know the dip will be cool and fresh until lunch time! The size of the vegetable or fruit container is very generous and fits a good amount of fruit and veggies for my kids! Also pictured above is the Kids' Soft Touch Lid Lunch Pod. We loved the size for all ages (4-11). Packed here are an apple sauce, orange slice, a gluten free cereal bar and an entire peanut butter and jelly sandwich cut into puzzle shapes. Again, we loved the ice pack in the lid which kept both the fruit and sandwich nice and cold! And all the boys loved the print. We do have to take turns with this one since it is both roomy and has a great design! One of my favorite features of this bag is the little mesh bag that you can use to hold a napkin, utensil or ice pack! It fit both one of our big Thermos FUNtainers and the Kids' Soft Touch Lid Lunch Pod with room for another ice pack, napkin and utensil. Again, the print won over the practicality and design immediately! Plus, we love the cute pocket on the outside that can hold extra food or utensils! This lunch bag is even roomier due to it's unique shape and held a juice box, apple, the lunch pod and a cereal bar easily with a napkin, utensil and ice pack fitting neatly in as well. Plus we had room to spare!! Overall, we loved all the Fit & Fresh products we tried. The unique design that incorporates the ice pack into the lid makes it easy in the mornings ( I keep both the lid and ice pack in the freezer) and I know that my kids' food will still be fresh and cold by lunchtime. My kids really loved all the fun colors and designs and I appreciated the fun, easy to use design, easy of cleaning and versatility of all the products! And of course, all products are BPA free, the cooler bags have an easy to clean PEVA lining and all products are dishwasher, freezer and microwave safe! Great review, Nina! Love that snack and dip container.